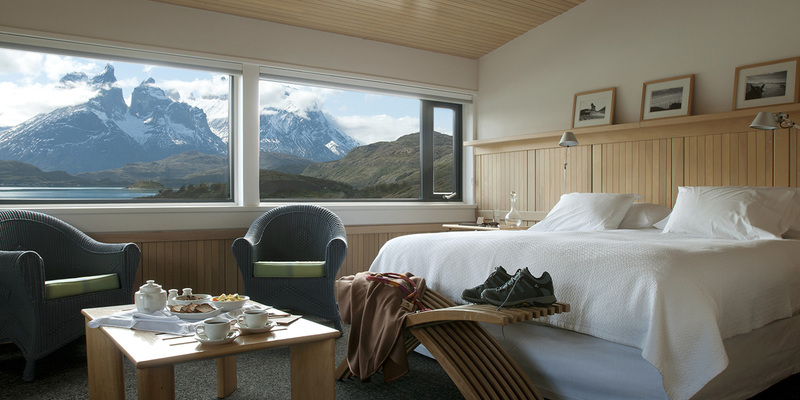 Our hotel is located in the center of the Torres del Paine National Park, a unique place in the world, located in the heart of Patagonia and that its varied and untouched landscapes, was declared a Biosphere Reserve by UNESCO. Opened in 1993, our hotel is located on the banks of the Salto Chico waterfall, from where it has a privileged view of the Paine Massif and two of the three towers of the same name. With 49 rooms and cozy spaces, the hotel is located in an area of almost 3 hectares borrows certain organic forms of the landscape, adapting to it with simple elegance. Its construction has been designed to create a dialogue with its environment, the human with the sublime place. The hotel provides the welcome surprise of being in a remote area of comfort situation, not isolated from nature, but placed "within" it. Our hotel has 49 comfortable rooms, all with captivating views, quiet, privacy and comfort. Delicate design, construction wood used lenga and cypress brought from the archipelago Guaitecas and almendrillo floor. There is a small sitting area, bathroom with bath and beds designed for deep, pleasurable sleep after a day of exploration. Finally, a unique treat especially considering you do not have TV. 7 rooms of 28 m2 overlooking the waterfall Salto Chico. 37 rooms, 28 m2 overlooking the Paine Massif. 6 suites, 42 m2 overlooking the Paine Massif. 100 m from the hotel and connected to it by a wooden walkway sloped, this place has a heated indoor swimming pool, sauna and four outdoor hot tubs overlooking the lake Pehoé and Paine Massif. In it, plus you can enjoy various types of massage with essential oils: therapeutic, relaxation, energy, and others. Patagonia, in addition to its pristine landscapes, home to the unique and legendary gaucho culture. You can drink "mate" with them, see sheep shearing, herding cattle, horses amansadura and other typical tasks in this area stay of 6,000 ha, and explores property located 53 km from the hotel. Located at the entrance of the Villa 2 January, the barbecue is the starting point for some of our rides. It is also the place where, at various times of the year you can participate in one of the most typical Patagonian cuisine: preparing a roast lamb. Around his slow preparation, "mate" is shared with the gauchos and interesting stories are heard of the place. The wait is worth it. How a small work can live with such stunning scenery as Torres del Paine? Faced with this challenge we chose a size in length, facing vertical Paine peaks and a white painted exterior, to assimilate to the snow and icebergs. The structure and cover the perimeter of the hotel is concrete beams and wood combination that allows face the climate of Patagonia, oscillating temperatures and strong winds. The interior is warm and bright. The light is constructed by combining the warm grain of the beech, wood typical of the area, with white covering some sectors.